Adopting new technology may come with challenges that sometimes overshadow the benefits we may be able to derive from the novelty. Perhaps the biggest challenge is convincing ourselves and the rest might follow. If presented with the opportunity to try new alternatives, I like to jump right in with two feet and see the benefits and the challenges for myself. As an educator in the digital age, I rely heavily on a technological platform (e.g. Blackboard, Moodle, Canvas) to carry out my courses. When it comes to these learning management systems (LMS) switching from one platform to another is not as strenuous as one may initially think. The Canvas pilot at CI provided just that opportunity this semester and I have been testing this new LMS since December 2016. In this short amount of time not only have I been discovering a new feature each day but also I started to become accustomed to the intuitive platform, a little too quickly. As I began collecting feedback from the students in my Principles of Marketing class this past week, I started to reflect on and evaluate my own experience with Canvas so far and came up with a few preliminary observations and takeaways to share. I usually find myself cautious at the beginning of pilots like this. After all I am not familiar with the platform and I worry, a mistake may be too costly in terms of how much time it will take to correct it. On the other hand how do we become familiar with any platform, other than to explore and experiment with it, right? Canvas offers a lot to be explored both in terms of content and in terms of functionality. For instance, the option to integrate applications like TEDxEd multiplies the ways with which one can enrich their course content. We will talk about the content in the next section so let’s focus for one moment on the various functions. What type of functions a Canvas site serves is limited by each instructor’s need and interest. You may use it for very basic functions like creating and publicizing your syllabus, keeping in communication with the students enrolled in your class or creating an archive of course materials, assessment mechanisms as well as team assignments. If you are more adventurous, then you may want to check out adaptive release features such as prerequisite and requirement additions into modules or creating learning mastery scales; you may even create your original material and share it on the creative commons with other users. Experimenting with Canvas is really low risk, as one-click (the green clouds on the left) publishing and unpublishing options provide immediate control over what is available to students. So you can experiment all you want and not publish your trials until they are ready. Another reason I am able to take risk and experiment with the building blocks of a Canvas site is the easily accessible support not just on forums and faq pages but through the help button that puts you in contact with a support team; so if things seem to go awry there is always someone to get you back on track. The support and incentives offered through the OpenCI initiative fit very nicely into a course constructed on Canvas. Moreover Canvas provides Creative Commons licensed materials that can be incorporated into course content. One drawback is just the sheer amount of content that is available if you chose to explore, at times it gets overwhelming. Beware and pace yourself to stay focused. 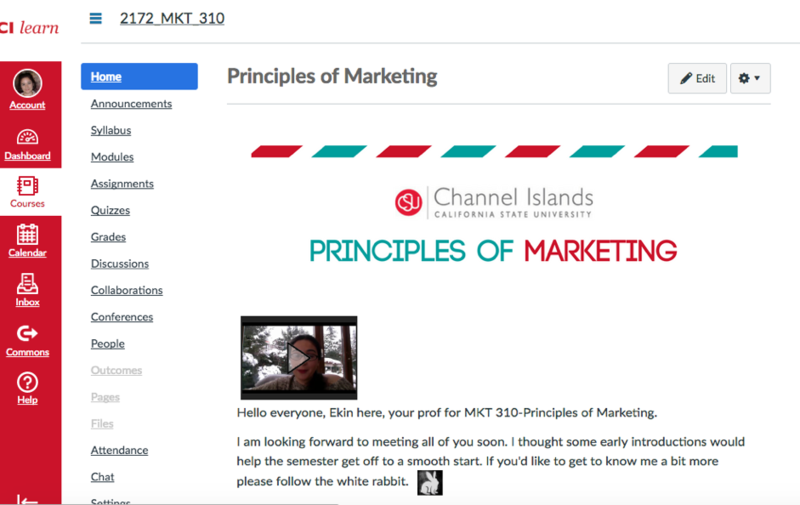 Canvas Commons is a shared space where instructors and content creators may share anything from pre-made module templates to short videos and activities for different educational levels. Our very own Michelle Pacansky-Brock prepared several elements like module templates or visual themes you may choose to use when creating your class. All you need to do is go to the search box and write her name or CSUCI and click import into course on the next page. One thing that really caught my attention is how Canvas enables the instructor to carry out multiple tasks on its platform. The red tower tab on the left side of your canvas view has a few tabs that are worthy of note here. The option to create a personalized profile which is available to your students, or the convenience of managing course related messages through the inbox and appointments through calendar is really are definitely top of my list. I have been regularly using the inbox tab although I receive the emails in my email inbox as well. I find that having this separation relieves any overwhelming email anxiety. You know students’ emails won’t get buried under all other messages you get throughout the day. Recently I also used the calendar tab to open up parts of my calendar to the students so they can schedule a-half-hour visit with me by only clicking on the time they wish to come. It was so much easier than dealing with individual emails back and forth to find a good time with 35 students, using third party apps like Doodle or arranging it on Outlook. The Commons tab takes you Canvas Commons which is an open source of content and structures you may copy and adopt in your own course. The convergence of these functionalities alone would make Canvas a superior learning management system in comparison to others I used so far. Add to that, the ease-of-use and intuitive way to construct your course page and you have a new platform that may be worth exploring. Get Writing Done in the WMC Writing Lab!